In a galaxy far, far away…: Khalkh Mongol or Queen Amidala? I’ll be the first to admit that the Star Wars ‘prequel trilogy’ had issues (*cough* Jar Jar *cough*). 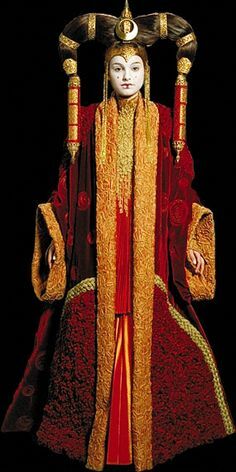 But one thing, which certainly inspired me, when I saw the first one back in 1999, was the splendour, intricacy, and (perhaps uncomfortable) beauty of Queen Amidala’s wardrobe. 13-year-old Sophie spent quite some time that summer, drawing elaborate costumes, imagining herself the costume designer on the next round of Star Wars film, if they were ever to be made. Now they are a reality, but I am working at Moesgaard Museum, not on the set of Episode IX – yet that does not mean that I do not get to spend my time surrounded by clothes, which might come straight out of Star Wars. But in fact it is the other way around: I am surrounded by the clothes on which Queen Amidala’s wardrobe was based. “There is a myth that the Khalkh Mongols were the fruit of a love affair between a nature spirit and a cow: the cow suckles the first Khalkh Mongol and gives them a love of animals and the nomadic life. The married woman’s cow-horn hairstyle is a reminder of this nomadic heritage. Sumptuous hair ornaments hold her coiffure in place, which is styles with sheep fat. 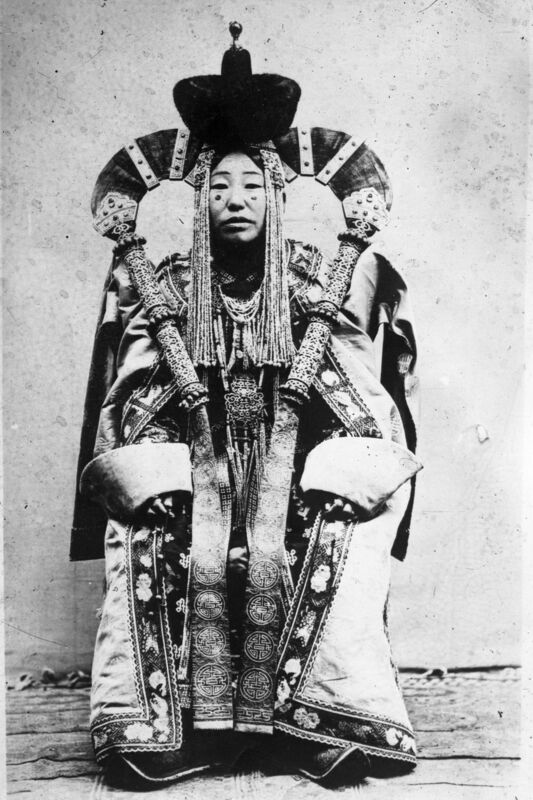 The costumes were worn by an upper-class woman and are inspired by fashion in the 17th century: long sleeved dell (traditional Mongolian coat) with cuffs formed like horse’s hooves, a sleeveless waistcoat and boots with upturned toes”. The mix of movie magic, imagination, and solid handcraft that goes into costume- and set design has always fascinated me. 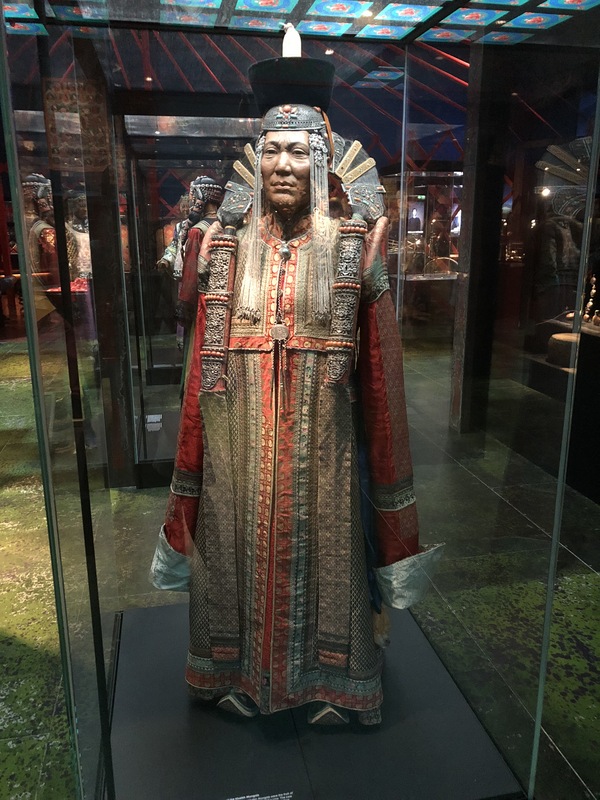 And the more I explore the material culture of various people from all over the world, the more I recognise how my favourite fantasy- and sci-fi movies draws their inspiration from just such material cultures. And it also goes to show that you do not need to go to a ‘galaxy far, far away’ or indeed to the movies, to see spectacular and beautiful things. You just need to visit a museum. Do you want to know more about the wonderful Mongolian collections? Visit the exhibition ‘On the steppes of Genghis Khan – Mongolia’s nomads’ at Moesgaard Museum, or read Christel Braae’s fascinating and richly illustrated book Among Herders of Inner Mongolia: The Haslund-Christensen Collection at the National Museum of Denmark (2017).